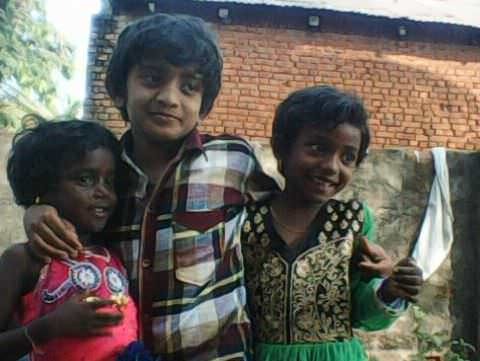 Mutyala Ramakrishna and his family – consisting of wife Varalakshmi, son Siva Ganesh and daughter Eswari lived a simple but happy life in Devarapalle, a small village in the West Godavari district of Andhra Pradesh. Being a lorry driver, though Ramakrishna could not spoil his children with expensive gifts or take them to the movies every weekend, he made sure he was giving them the best gift he could afford: education. 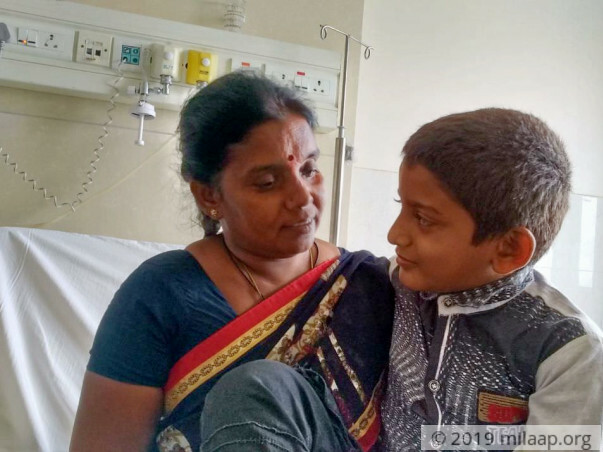 The family was able to manage with whatever little money they had until 2015 when Siva Ganesh was diagnosed with a serious heart condition, and his medical expenses started exceeding their income. “Until 3 years ago, my son was perfectly alright. He was like any other 7 year-old – playful, energetic and very naughty. But one day unexpectedly, he got a fever that persisted for days. Along with that, he complained of losing consciousness now and then. He had fainting episodes too. We were very worried. He was healthy and had food properly, then why did he become so ill all of a sudden?” says Ramakrishna. 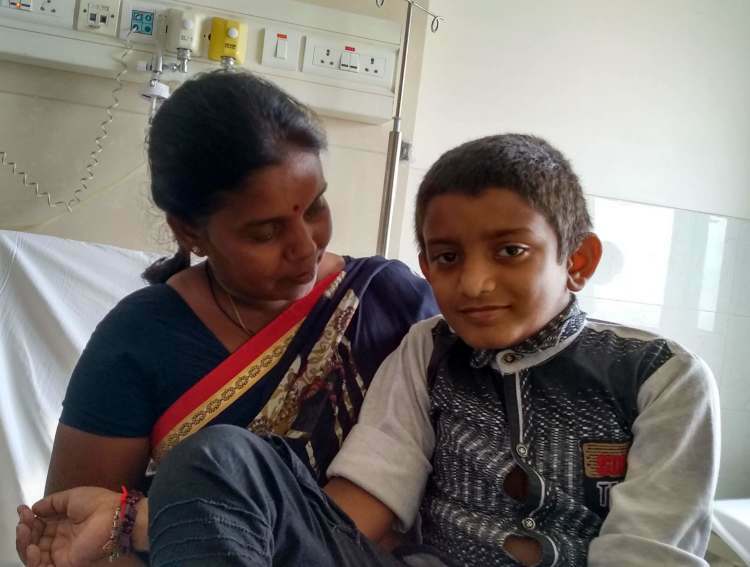 When the fevers kept coming back, his worried parents took him to a doctor in the village, who then suggested they go to a better hospital in Hyderabad. The parents were willing to go to any extent for their sick child. “We didn’t have any money as such. 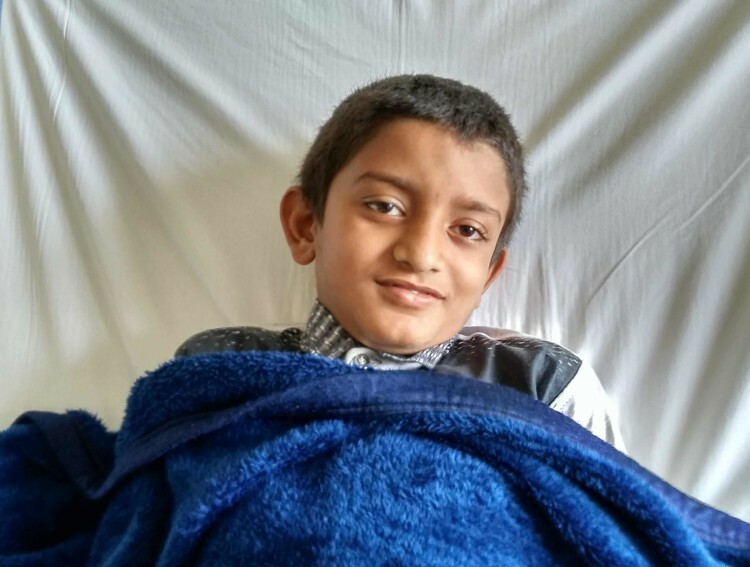 We just took whatever little we had and took him to Hyderabad as we were told he has a serious illness. A couple of tests and scans later, we were told that his heart is not functioning the way it is supposed to. The blood pumping is taking place in a wrong way, and that is why he is fainting too often. I could not understand what was happening. My wife started crying and Siva started getting upset too seeing his mother,” Ramakrishna recalls. “Usually, when somebody in the village is in dire need of funds, everybody pools in money and tries to help as much as they can. But in my poor son’s case, nobody came forward. Since my son is going to school and looks alright, they think he is fine. But he is not. His heart has a block that may turn fatal very soon. His heart can stop any moment and will need to rely on a pacemaker for the rest of his life.They don’t understand that,” says Ramakrishna adding that he had gone to ask help from people in his village and the MLA of their constituency, but had to come back empty handed. 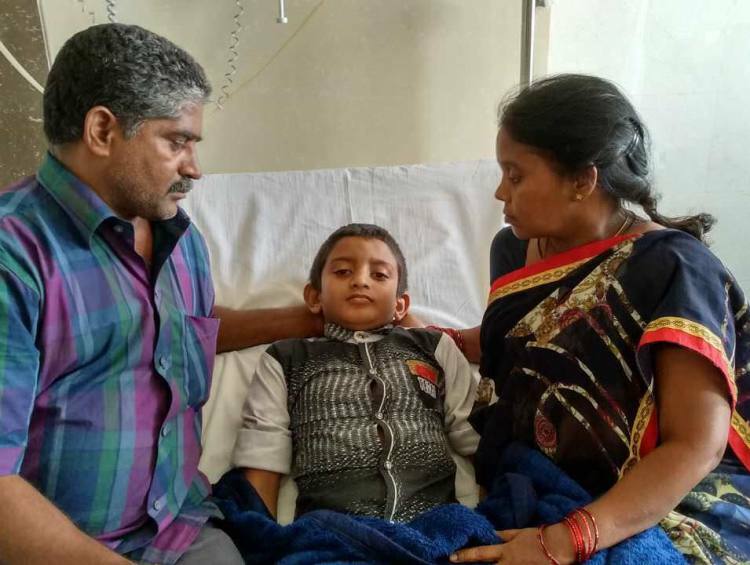 Siva Ganesh needs an urgent operation that costs Rs 4.5 lakh, but his father Mutyala Ramakrishna cannot afford it. 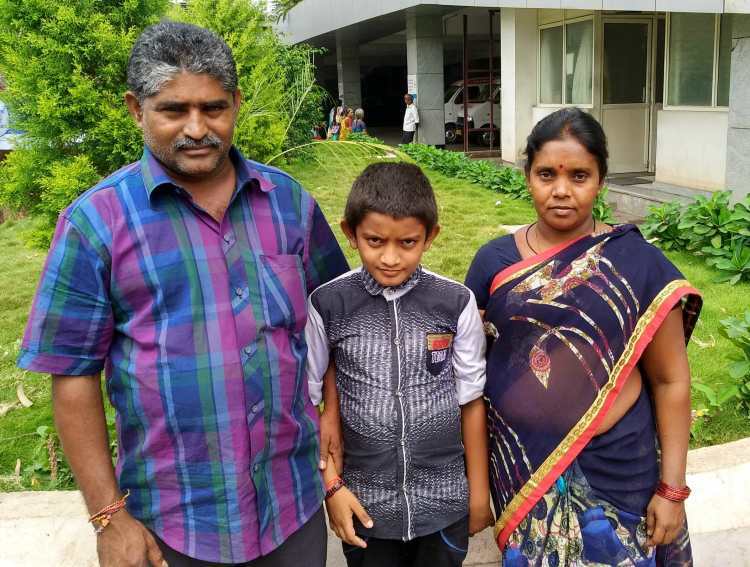 Every 6 months, he has to take his son for review to the hospital in Hyderabad, and that itself costs Rs 15,000, which he borrows from moneylenders. Siva’s elder sister, 12-year-old Eswari has stopped buying things, even small pencils, for herself as she knows the crisis her family is going through. Your small contribution can help this family sail through this tough time. Thank you for the support shown towards Siva Ganesh. 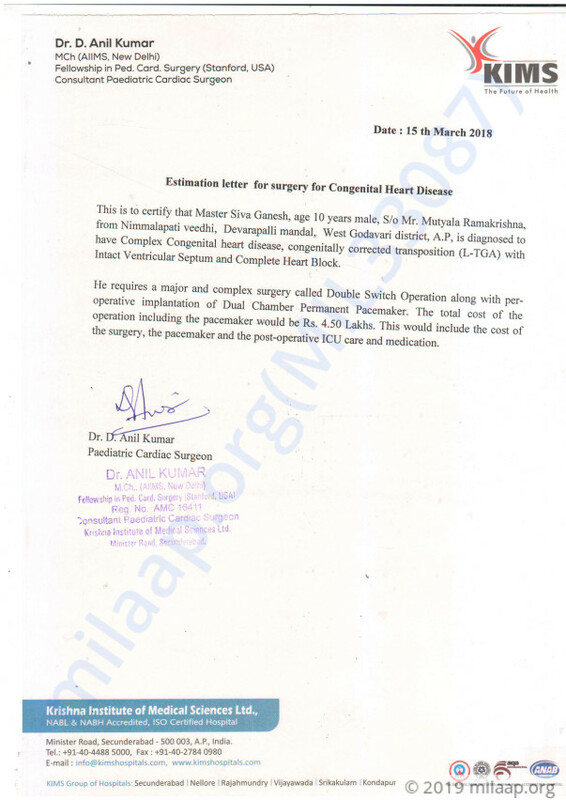 He is presently at home and still awaiting an open heart surgery which we haven't been able to proceed with due to a lack of funds. He has fainting spell often and we are eager to see him get better. We request you to share his campaign with everyone you know to help him get the help he needs. Here is a quick update on Siva's health. Currently, Siva is at home and doing fine. He is on regular medication as prescribed by the doctors. We visit the hospital for the follow-ups. We will be visiting the hospital next week, doctors will schedule the date of operation after diagnosing Siva's health condition.